is holding on like grim death. 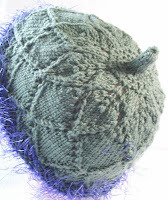 It would be finished –but for a mistake and frogging a few rows. Maybe I'll make some progress today—I'll be knitting on my way too, (and home from) the Brooklyn Public Library—The Brooklyn Fiber Arts Guild is presenting Debbie Stoller tonight there – And while she is not my favorite author, I like the yarn line that is out in her name, (and have knit a few things with it) And I have a lot of friends in Brooklyn and it's a good opportunity to see them too. The Thistle Down hat pattern is completed. And now up for sale. And pondering.. Christmas is fast approching and I still have holiday knitting to do! When will I find the time?